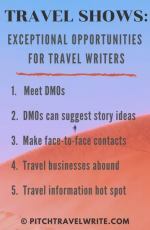 Executive Summaries are lists of tourist attractions that travel writers create for an upcoming trip. It’s one of the techniques I use with writers I coach. The writers create these summaries for their planned destinations and then send them to me to review. We use these executive summaries to plan potential story ideas and to help us target magazines to query. About 5-6 months before I travel to my destination I create my executive summaries while I’m researching each destination that interests me. 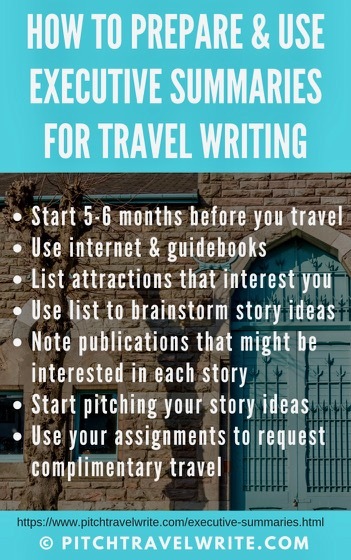 I research the countries and cities I plan on visiting and write down copious lists of potential story ideas and potential target magazines for these stories. Using the Internet and guidebooks, I research each destination. I scour the Internet, copying and pasting details of the most interesting tourist attractions onto a master list. This is the information that is placed on what I call “Executive Summaries”. Once I’m satisfied I’ve created a complete and comprehensive list of the main tourist attractions from the Internet, I read through guidebooks, looking for additional attractions. I’m always surprised how many additional attractions I find using guidebooks. The Internet is not the all-seeing oracle that many believe it to be! There’s always some important attractions missing. Once the executive summaries are complete, I create query letters for the places that look the most promising. Then I fire out my queries en masse. I’ll blitz out query letters to hundreds of magazines over 3 to 4 weeks. This is a sophisticated system, and I'm really experienced at using it. However, for beginners, it can be an intimidating project. 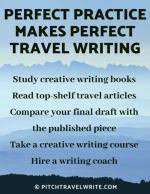 The idea of pitching and selling stories before you travel is a difficult concept to grasp, even for veteran travel writers. Although this is a sophisticated system, it’s also simple to implement as you’ll see below. My most successful executive summaries were for a 6 week trip to Europe in 2013. I visited several countries and attractions within each country. I prepared an executive summary for each country I visited. I listed all the places I planned to see, the things I wanted to do in each place and attractions that interested me. Then I used the list to dream up story ideas and potential magazines to pitch. Using the completed list, I started sending out queries. After a month or two, and before I left home, I had secured 36 assignments for 10 different paying magazines and paying websites. I returned from this trip with a profit of $4,131. 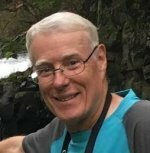 I also saved thousands of dollars by parlaying my assignments into complimentary accommodations, meals, personal guided tours, entry to tourist attractions and museums, car rentals, and other perks. Below you’ll find executive summaries one of my writers used to plan a European river cruise. She wrote a summary for each place the cruise line stopped. In yellow highlights you'll see my notes and comments, including potential magazines to place on the distribution list and pitch. Bocksbeutel – a different kind of wine bottle. Pitch to glass blowing magazines? Zeppelin Field – where most of the large Nazi parades and events took place. Pitch to travel WWII, & other WWII mags. Walhalla, Donaustauf – German Temple of Fame? Find out more details. Could be story here. Pilgrimage Church and Pauline Fathers’ Monastery – 360 stairs to reach Mariahilf Kloster with beautiful views of the city and rivers as well as a small beautiful church at the top. Schloss Schonbuhel – castle overlooking the Danube – 12th century but built on the site of an former Roman fort – relief of The Last Supper on an exterior wall. Old Town Melk – situated below the Abbey, a walk through the old town is like a walk through history. Pitch to Rennaissance mag. Vinothek Domaene Wachau – top wine producer in the Wachau region – have a tasting and a wine cellar tour (Durnstein). Pitch to wine mags. Burgruine Duernstein (Castle Kuernriger) – ruins of the castle where Richard the Lionhearted was held prisoner during the crusades before being ransomed. Pitch to Rennaissance mag. Stephansdom Crypt – crypt that holds royal intestine and thousands of skeletons. Pitch to Rennaissance mag. Habsburg Imperial Crypt – resting place for the remains of 143 Habsburg royalty. Pitch to Rennaissance mag. Kriminalmuseum – museum devoted to the history of Viennese murders. Comments: Pitch Roundup to Ren & History mags. Labyrinth of Buda Castle – series of caves under Castle hill that once held Count Dracula – Vlad Tepes prisoner. Good story!! Szabo Ervin Library – 19th century aristocrats mansion which was turned into a library but it is actually hidden in a modern library. Antique & book mags? Terezin Concentration Camp Tour & Memorial. World War II Magazine, other world war II/military history magazines. Jewish magazines. Pitch to Jewish mags. Also general travel magazines. Prague Astrological Clock –automaton clock that dates back to the 1400’s. Pitch this story to watch magazines. Strahov Monastery – 17th century libraries and cabinets of curiosities. Pitch to Christian magazines. I don’t have a list of these, so you’ll need to do a search for them. Magical Cavern – old mill converted to a cavern like fantasy by an obviously eccentric artist. Pitch to General travel magazines. The Museum of Alchemists and Old Magicians of Old Prague Speculum Alchemaie – an Alchemist’s lair discovered after a 2002 flood. Pitch these two stories to general travel magazines. Olsany Cemetery – Prague’s oldest cemetery. Pitch as part of a Prague roundup story. By glancing through these sample executive summaries, you can see how straightforward it is to plan your assignments and target magazines from this list. Before you go on your next trip, put together an executive summary as you’re planning your trip. Use it to dream up story ideas and potential publications. Then get busy pitching – before you leave home!